Photo by Jubenal Aguilar | Sharon Jackson (left), mathematics professor; Chancellor Joe May; and Brookhaven College President Thom Chesney talk Oct. 15 in the Performance Hall about how the district is working to make students’ experience better. Brookhaven College will become the first of the Dallas County Community College District schools to offer a baccalaureate degree on its own. The announcement was made Oct. 15 during Chancellor Joe May’s visit to Brookhaven for a panel discussion with Thom Chesney, Brookhaven president. During the discussion moderated by Sharon Jackson, mathematics professor, an increase in tuition that will go into effect this summer was also announced. May visited Brookhaven to discuss the district’s progress toward becoming a student-centric network of higher education and how each college fits into that plan. Brookhaven was the third college May visited. 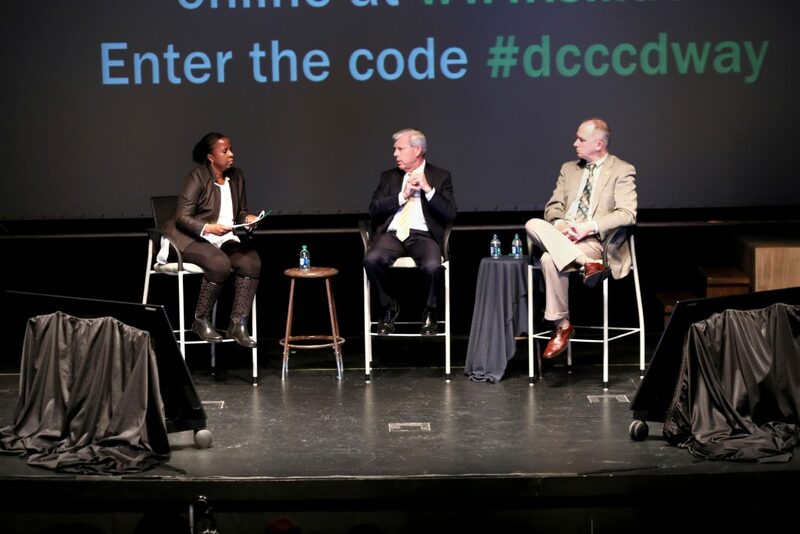 The chancellor said DCCCD was given the authority to offer three baccalaureate degrees – one in early childhood education, a Bachelor of Science in nursing and another in a technical area. May said the district’s main interest was focused on the early childhood development baccalaureate. Two colleges – Eastfield College and Brookhaven – were eligible to offer the degree, May said. However, all seven colleges will be involved in order to reach the number of graduates needed. May said he will recommend Brookhaven be the college that awards the degrees for the baccalaureates at the next board of trustees meeting. He added that while initial paperwork filing has been completed, additional steps, including status elevation with the Southern Association of Colleges and Schools, need to be completed before the first courses are offered. The discussion between May and Chesney focused on many of the problems students face and how they can overcome to help them make the most of their experience with the district. The district received answers from students in a student experience survey completed two years ago. May said textbook prices were one of the key items that were found to be an obstacle to course completion. “Forty percent of students did not buy textbooks, not just on the first day, but ever during the course,” May said. The lack of materials has led about 18 percent of students to not be able to complete courses. To ensure all students have the required class textbooks when the semester begins, May said, a $20 per credit hour increase in tuition will be implemented in summer 2019. The increase will automatically include required textbooks for all courses. May compared the textbook initiative to how high school students are provided textbooks for each class they are enrolled in. As of October, DCCCD has partnered with over 31 Dallas County high schools to offer free higher education to graduating seniors. May said 12 high schools will be added each year until all 107 are part of the district’s higher education promise. The Dallas County Promise, May said, has increased district enrollment by 40 percent. This increase has also translated to an increase in enrollment in local four-year schools such as the University of North Texas at Dallas, which has seen a 30 percent increase in enrollment from the same high schools. May said the first cohort of Dallas County Promise students helped reveal a need for some parents to also have access to higher education. Among the first 2,500 students, 200-400 parents were found to have not attended college, May said. The district created an initiative to help these parents receive the same benefits as their children. He said 300 parents showed interest, but only 67 enrolled in college at DCCCD. “We aren’t going to be able to grow this as fast as the Dallas County Promise because the goal is to raise $20 million over the next three years to support that,” May said. During the discussion, May and Chesney also talked about other initiatives that have been created to help students. Among these is the DART GoPass partnership, which provides free public transportation access to nearly all students in the district. May said over 10,000 students are using the pass each semester. Guided Pathways is another initiative that was created to help students be more successful. The pathways were created to help students plan their education and stay on track to graduate, transfer or find work. Beyond transportation issues, May said, students also face food insecurity, health and other obstacles that may prevent them from completing their degrees at DCCCD. All campuses now have food pantries to help not just students, but also staff and faculty that might need food. Aunt Bertha, an online platform for organizations that help individuals find social services, has become an important tool to help students find various things such as childcare, shelter and legal aid, among others. May also said the mental health of DCCCD students is important. The district has partnered with UT Southwestern to help provide mental health services to all the colleges. This partnership will help DCCCD build relationships with partner hospitals and eventually bring health clinics to the campuses, May said.